03: PhotoBlocker Spray : Buy 3 Get 2 More Cans FREE + FREE Shipping 50-70% OFF! Discounts Apply ! Reflects photo radar flash. Spray it and make your license plate invisible to cameras. Proven to beat photo radar and red light cameras. Click here to watch Test Result. Featured on CBS News. our products to defeat toll booth cameras. YES, IT'S TRUE ... ONE-TIME APPLICATION IS GOOD FOR LIFE! Photo radar cameras often utilize a strong flash to photograph the license plate on your car as it speeds by. "PHOTO BLOCKER's" special formula works to reflect the flash back to the camera. The result is an overexposed and unreadable picture, often preventing a costly ticket. 01. Remove plate. Place flat. 02. Spray PhotoBlocker evenly until surface is totally saturated. Let dry and repeat 2-3 times until plate is very glossy. 03. Let it dry for about 2 hours. Should be good for life! REFLECTS photo radar flash, helping to prevent a costly ticket! FAST spray-on formula is easily applied in minutes! INVISIBLE to the naked eye, only you will know it is on your vehicle! EXCLUSIVE formula! Good for up to FOUR plates. BEST alternative for those areas where you can't use an anti-radar license plate cover! One application of PhotoBlocker is good for life. Will not wash off, will not fade, nor will it dissolve away. 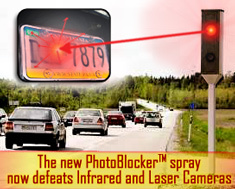 *** 30 day money back guarantee**** .“License-plate spray foils traffic cameras” Washington Times "